This month, our cover art is by Reiko Murakami, illustrating a new science fiction story by John Grant (“The Law of Conservation of Data”). We also have a new one from E. Catherine Tobler (“Mix Tapes from Dead Boys”), along with SF reprints by Chris Beckett (“Marcher”) and James Tiptree, Jr. (“The Last Flight of Doctor Ain”). 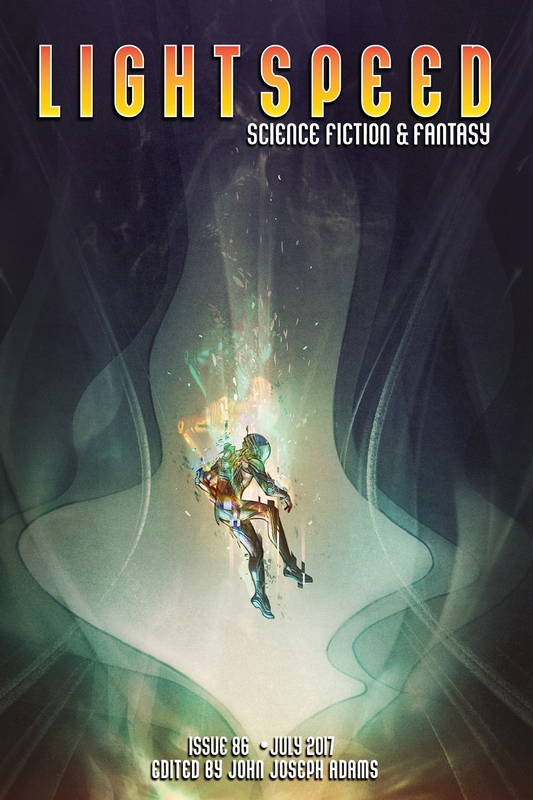 Plus, we have original fantasy by Alvaro Zinos-Amaro & Adam-Troy Castro (“A Touch of Heart”) and Debbie Urbanski (“How to Find a Portal”), and fantasy reprints by A.G. Howard (“Stitches”) and Will Ludwigsen (“Acres of Perhaps”). Our nonfiction department is serving up our monthly book review column, as well as Carrie Vaughn’s assessment of the new Wonder Woman movie. Speaking of Carrie, we’re also giving our readers a chance to really get to know her, as she’s the subject of this month’s feature interview---and if you’re an ebook reader, you can get a little taste of her new novel, Bannerless, out this month. Our ebook edition also has a reprint of the novella “From Whence You Came,” by Laura Anne Gilman. You’ll also get a bonus excerpt from An Oath of Dogs, by our own Wendy N. Wagner.